Old age and even more so death seem to be quite high on the taboo list of many Western societies. Somehow I have the feeling that many people assume that by simply never touching the subject they will never grow old or never die. Hmm. These people might be in for a surprise. Then there are societies where such topics are not taboo, but part of life. 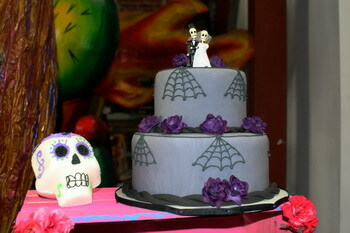 The “Day of the Dead” in Mexico is one example. The whole family goes out to the cemetery, they clean the grave site of dead relatives, put up candles and flowers and have a picnic. Yes, the kids are there, too. They learn very early on that life and death are interwoven in an endless circle. Another tradition is the building of private altars for the deceased in the family. These installations are very colorful and incorporate photos of the family members to be so honored, flowers, their favorite foods and skulls made of sugar. Lots of children were running around at the art gallery, having fun and munching little sugar skulls. One hopes so much that they will grow up with a healthy understanding that old age and death are part of life for all of us. Of course, Dia de los Muertos is big around here. I’ve never quite understood the whole skeleton thing, though. It’s a lovely custom. 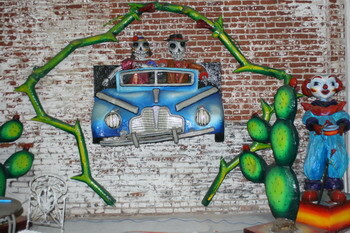 I love Mexican folk art. I have one gorgeous retablo of a Dia couple (skeletons) representing lifetime love. I also have two painted tin nichos, which I love. In fact, now that I think of it, I have quite a bit of Mexican folk art. Oh, and we have roadside and neighborhood shrines here. Most are devoted to the Virgen de Guadalupe. I love those. 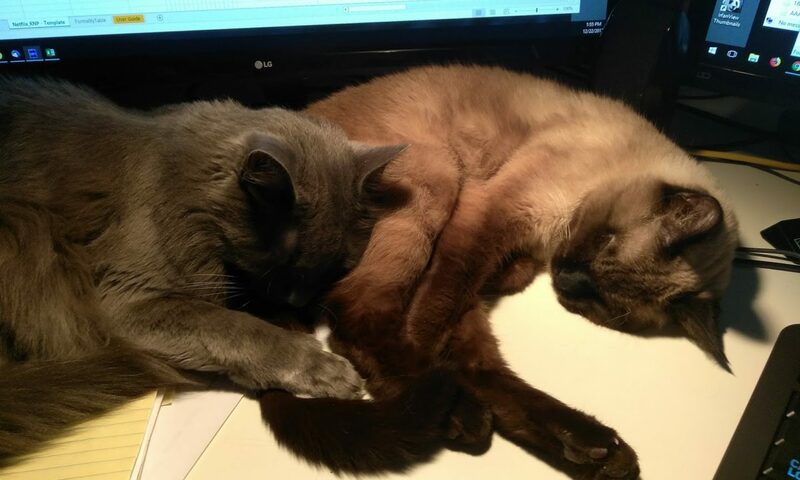 They are just so sweet. 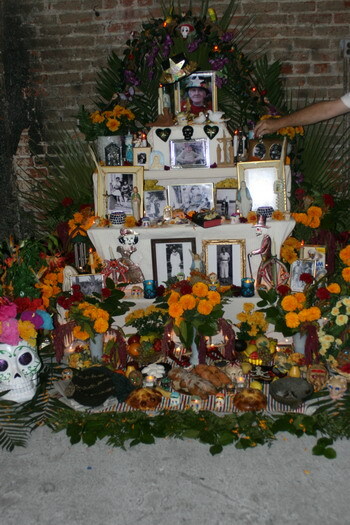 I have actually never seen an altar/shrine here, even though so many Mexicans live in Los Angeles. I saw a couple of wonderful shrines for the Virgen in Arizona, on the way to Phoenix. I do like Mexican folk art, but our house does not really lend itself to displaying it; we do have some Oaxacan wooden animals, though, which I just love. Oh, I so know what you mean. I have stacks in the office, stacks tucked behind things in the bedroom, stacks under beds, stacks in the attic. Some of it, I seriously need to get rid of. Some of it is far too good to toss, and I’m sure I’ll display it again. I like to change things up. I love the Oaxacan animals, too. But I don’t have any. I have some brightly painted cats that came from Key West, though, that look Mexican.